This kinetic novel (similar to a visual novel, but with no player choices) is very well done. You will have to fiddle with some options, but you can change the size of everything within the novel to make it as readable as possible. It has an excellent story, one that is often recommended to those who have never played the genre, and is worth a play-through regardless of your feelings about "anime" (the story stands on its own merits without the graphics). It had no bugs that I was aware of, and other than a few odd translations, was pretty much flawless for an iPhone kinetic novel. 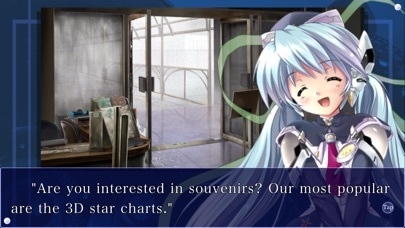 Priced even at $3.99, 'planetarian ~dream of a little star' is a worthwhile purchase for any visual novel fan. With an official English translation by Visual Arts, it is worth it just to support the developers. The app itself is very well made. It's stable, snappy, and universal, meaning your purchase is valid for all iOS devices. The way they developed the UI is very nice and out of the way. The bottom left button rewinds your progress. Top right button opens the menu for settings, bookmarks, contents, etc. Tapping on the conversation box progresses the story. Playing on the iPad version does let you see more of the original art. On the iPhone version (obviously, because of the smaller screen resolution) Yumemi is cut off from her waist down. There isn't anything new from the original PC version. All original Japanese voices for Yumemi Hoshino (Keiko Suzuki) and the Junk Hunter (Daisuke Ono) were preserved. As for the actual visual novel, it is relatively short, but what it lacks in length it makes up for in quality. The story is fairly emotional and detailed. It is very refreshing and encouraging to see this visual novel make it to iOS with an English translation. Any chance for Key's work to get localized is a good thing. 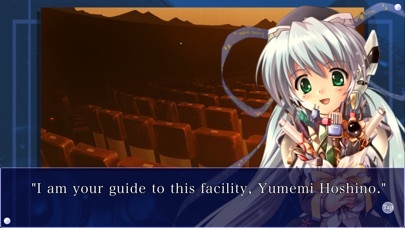 I hope more visual novels, not just from VA/Key, make it to iOS and other mobile platforms. Buy this app, you won't be disappointed, and tell your friends about it too! Bought this immediately when I found out it was released. Not just a visual novel translated to English, but an official translation of a Key novel? Hopefully this hints at future translations. As for an actual review, this is a short story, a few hours long. It's simple, but very emotional. I thought I was dreaming seeing a Key visual novel being translated into English. This is a great story and would LOVE to see more VNs in the future. Wonderful, thoughtful, and beautiful. I hope this is a sign of more visual novels being more readily available in the App store. As someone who has purchased multiple platforms of planetarian, and numerous merchandises, I am still amazed that it has finally given an official English release. Being what I consider one of Key's greatest work, it is good to know that more people can experience this wonderful story. 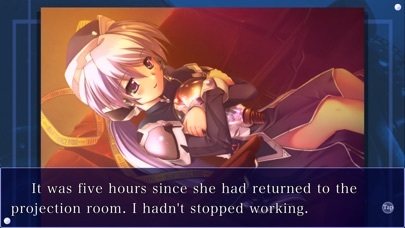 Hopefully this will be a good first step in having planetarian translated into more language, and more of Key's works being localize as well. I love anime and manga, so when this came out in English, it was a no brainer. The story is great and the voices bring you into the story. I really wanted to hug yumemi so much while reading this. This is what Key's stories are known for. They introduce a heroine whom we grow to love throughout the story, and then leave you desperate for more in the ending. It's a tear jerker, but a story definitely worth reading. Key's Visual Arts are brilliant with their stories, have wonderful music and art, and this is definitely worth the $5. I'm just hoping for more English translated novels from this company. I was so excited to see an official release of a Visual Novel here on the iOS App Store! Especially a game by Key! This is a fantastic read, and a truly amazing experience. Thank you! I'm trying to spread the news about this port! I hope that you will continue to release more games on iOS! I bought this as soon as I saw it was available. This is an incredible visual novel and one that certainly shouldn't be missed. I look forward to future English releases from Key! As many of the previous reviews stated, I too bought this as soon as I heard Key released an official translation. And I must say it was absolutely worth it! The story it self is somewhat predictable but makes up with excellent execution. The game offers no choices like other usual light novels and is pretty straight forward. I do hope key will continue with this and translate Clannad and Little Busters. Thanks Key! Key! Please bring more to America! It's about time that Key releases an English version of their incredible Visual Novels! This is another great story and I'm glad it's finally in English and on iOS! I seriously thought this day would never come. Key please for your 15th, rerelease all of your other classics in English and on iOS! Even Mac would be great too! Please translate Kanon, Air, Clannad, Tomoyo After.. And so on! We love this stuff out here! So please start bringing them to the west! And lastly, I think I speak for a lot of people when I say that we would like to see a Tomoyo After anime! Clannad anime was amazing (in fact, all of your animes were amazing) and we'd like to see Tomoyo after done the same way! Thank you and keep up the good work! “Witness the Infinite Splendor of the Cosmos"
"Planetarian" is a visual novel that carries a simple tale with simple characters that find themselves in a fairly straightforward situation. Nothing about it is terribly complexed about it. But the way their drastic perspectives clash and interact is very profound and telling. It creates many layers of depth and a potentially life changing experience. CONTENT ISSUES: There is nothing for parents to worry about. This is a clean VN with virtually no questionable material. The main protagonist does say the D---n once or twice (maybe a few more...but as you can tell it was few enough for me not to remember). So, overall, this is a visual novel that anyone can pick up in terms of content issues. However, this is definitely one that requires an older audience to fully understand and appreciate. The themes are mature ones. BUT BACK TO THE GAME: For those that aren't familiar with visual novel genres of games, they are essentially games that are like glorified comic books melded with strong visual images, music, and storytelling. If you've ever played "Phoenix Wright", "Lux Pain", or "Symphonica"; then you are actually familiar with the genre. "Planetarian" is a Visual novel that breaks from that norm by having no "player choices" but strictly being a linear tale that the player reads through, page by page. 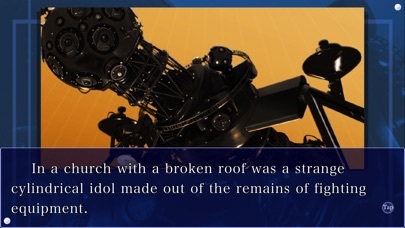 What amazed me was how this VN turned something so mundanely commonplace (a planetarium) into such a profound symbol (of what? I'll let you discover). The writing was exceptional and poetic, the illustrations were very detailed and beautiful, but not exaggerated or over the top, and the music was simple...but very potent when combined with the other two media (visual and narrative). The tale, itself, is predictable, but that was not it's point. but the point was not in that so much as it was in the interaction and lives of the characters. It is relatively short by visual novel standards (only a few hours long), but by the end I was left speechless as I contemplated many of the themes found therein. There are tons of ideas one can glean and muse over in this one, but suffice it to say I was left hopeful and was reminded of the wonder and miracle of life, living, and ambition. It really was powerful and an experience I would want to share with many people. Just to be clear about one thing, I played the port of this for the phone...so I'm not sure if it applies to this PC version. But the one key problem was that there were a few grammatical issues (this is a game from Japan...so they had to translate). They were usually more like typos (such as someone hitting "d" instead of "s" for the word "is" because the letter keys are so close). They were minor and not overly common (just common enough to note down, here)...and they definitely did not detract form the tale. ALL IN ALL: This is a profoundly beautiful tale that will give you much to think about and leave you more hopeful and determined in life. A simply amazing visual novel. Very tear jerking! Would recommend this to others. Worth every cent! Thank you so much for releasing this in English! The story was very touching. The art and music was very well composed as expected from any Key release. The surreal and mysterious atmosphere and mood is very much characteristic of your works. I hope to see more of Key's works in English in the future. As soon as I found out that this had been released, I jumped for joy and hurriedly bought it! This novel holds a special place in my heart. I remember buying the PC version and reading it years ago. I cried multiple times tears of sadness and joy. I'm glad to say that I still feel the same, if not more emotion, since then with this release! (Probably due to the vocal talent ;)) Good job on the translation! It flows smoothly with just a few bumps here and there. I hope that this is the start of seeing more releases from your vast library translated into English. ^^ And if anyone is reading this to get an idea of if they should buy this, I highly recommend it! Come and experience the dream of a little star shining in the darkness. Key Visual Arts's Planetarian is moving, emotional, and touching. Only Key Visual can do this. Planetarian was so very much enjoyable and heart-warming. I hope that they will continue to do this in the future with translated Visual Novels. This was by far, the best $3.99 I've ever spent. If you enjoy a good story, beautiful atmosphere, and character development, this is for you. 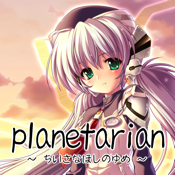 Planetarian is one of the shorter visual novels (stories with music, artwork, voice acting, and often branching paths chosen by the player - though this title is fully linear and lacks such choices) by a Japanese company named Key, who has created many great, affecting stories and characters. All of the text has been translated into English, and the voiced dialogue remains in Japanese, which is great because the actors do a stellar job of conveying inflection and emotion. I was thrilled to find this translated and available in the App Store, so if this sounds appealing to you, I urge you to buy it and experience it for yourself. You'll be treated to something to something you won't soon forget, and will be supporting the importation of some of Japan's best storytelling. If you like the music, which is also beautiful, you can find it in the iTunes Store under the Key Sounds Label. 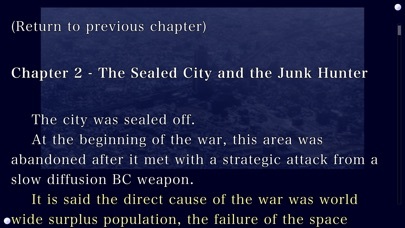 I have read many KEY stories, and Planetarian definitely lives up to the KEY label! It's a short story with only two main characters, but it's full of emotion. I laughed, smiled, and eventually cried at the end. The voice acting is superb as well. This is a great price for such a great story, and I highly recommend it! I'm very excited to see a Key visual novel translated and sold on mobile devices. Hopefully this bodes well for future translations of other visual novels to both phones and computers. Support programs like this if you want to see more like them! The visual novel itself, while short, is just what you would expect from Key. An emotional story paired with fantastic music and great characters. Recommended to fans of visual novels and anime! Most impressed with the voice and language option. Wish air Kanon Lb Ss and rewrite extras had voice too. Air and Kanon are all age versions so why not have voice just like the ps versions? The app size seems fine with voice. Purchased to support the developer! Even though I'm about halfway done with this game on my PC, I purchased this as soon as I found out there was an English version. I hope more of your VNs are translated to English. Thank you for the wonderful game though, made even more beautiful with retina graphics! Just like every other Key production; Amazing!! It made me cry.. planetarian is such a moving story with beautiful graphics and music, plus there is English too and the interface is simply great. Key is a master at making stories. That's all I have to say. If you are into Visual Novels then this is a must have. And with a first time English localization that is awesome! Lets hope Key releases some of there other legends from there collection; Clannad, Kanon, and Little Busters! Can't wait to see what's next! The west loves this stuff!! I wish we get more translated VNs like Clannad, Tomoyo After, Little Busters, Kanon, Rewrite and new ones! They are just so amazing! Bring more to the west please! I wrote a longer, more detailed, more passionate review, but it somehow ended up being erased after mis-typing my confirmation password ONCE. I'm kinda angry. I'll just be succinct this time because I can't recreate that earlier degree of fine-tuned praise... Favorable first impression. Embarrassment (I.e lots)of features and options. Fantastic voice acting, audio, writing, animate, and static images. Short game, but satisfying. Endearing characters. Outstanding atmosphere. Smooth app operation. Overall, just buy the visual novel. It's a great experience. Doesn't express how much I love this visual novel, but that's what you get when something erases the review of someone who is reluctant to type reviews in the first place. Thank you Key. Thank you Sekai Project. May more visual novels grace the west. Can you call it a game if there are no choices to make? This visual novel is more novel than game, but it still is an engaging experience. There is full Japanese voice acting and English text, but the graphics are mostly static with minimal animation. But what is great is that this is from the same company that made great visual novels such as Kanon and Clannad, so you get a great story and cute characters. You can put it into auto-play mode and it takes about 4 hours. There’s also a “Novel” mode where the text is shown full screen. I’m hoping that they will bring over more of their visual novels to iOS in English. I love this game! I have been collecting everything Key Visual Arts, and now I have this! And, If you guys could translate your other apps, like Kanon and Air, that would be amazing and everyone would get it. Seriously. And, make a Clannad port. That will make us all go crazy. Great game! Keep it up. I bought this novel immediately after hearing it was officially released in English. Overall, it was a great read, if not for the translation mistakes. Would love to see more games from Key available officially. So great to see a translated English visual novel. Looks and runs great. Being a fan of Clannad, Angel Beats, and Kanon; I wanted to give this a try because of how well this company writes their stories. This story was absolutely magnificent and truly phenomenal. Would recommend to everyone! This novel is absolutely amazing, and has only helped solidify the fact that this is one of the best app store purchases I've made. If Kanon and Air were released in English on iOS, I'd have no choice but to buy them as well. Key has absolutely outdone themselves.